According to a recently-released Hong Kong tax survey conducted by CPA Australia, Hong Kong is fast losing its edge against Singapore as a regional headquarters hub in Asia. The Hong Kong Tax Survey, which was conducted from October 6 to 30 this year, incorporated responses from 254 senior accountants and financial professionals based in the city. 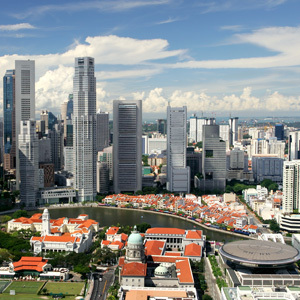 59% of them said that they preferred Singapore as their corporate regional headquarters primarily due to the tailor-made tax incentives it offers to those who fulfil stipulated HQ requirements. The respondents also cited high rental costs (31%), high living costs (19%), pollution (18%), high staff costs (12%) and lack of tax incentives (7%) as primary barriers for establishing a regional HQ in Hong Kong. Nonetheless, Singapore is no less immune to the issue of high staff costs as its regional rival. In recent weeks, Singapore media has been abuzz with growing grouses over the successive calibration of the Singapore work visa framework. Since the measures began in 2009, small to medium sized enterprises (SMEs) have been most vocal in articulating their concerns. However, now multinational companies (MNCs), on pain of buckling, are beginning to table their concerns as well. Companies, big and small, require predictability in order to plan their investments and determine how deep they want to sink their roots in Singapore. According to a recent report by the Straits Times, Singapore’s International Chamber of Commerce chief, Mr. Phillip Overmeyer, has recently said that MNCs may have to invest elsewhere if the foreign manpower tap continues to be tightened. In addition, Mr. Matteo Vezzosi, Singapore’s European Chamber of Commerce Executive Director, has reported the Chamber’s intent to begin a dialogue with the government to understand its mid to long-term strategy. It has also set up a sub-committee, consisting of 30 representatives of Singapore-based European companies, to look into manpower issues such as talent development and retention. “Although the measures are consistent with Singapore’s overarching aims to move towards high-productivity activities, it appears businesses need time and structural support to get there. Nonetheless, we are optimistic that for the time being, Singapore’s attractive tax rates for HQs, intellectual property rights protection, solid infrastructure and cleaner environment will continue to attract companies to set up their bases here,” affirmed Mr. Bakhda.